Based on the popular social network Facebook. $F_DISPLAY_LOGO = Displays the logo image in the header. $F_COLLAPSIBLE_CATEGORIES = Enables collapsible categories. $F_HEADERBAR_FIXED = Makes the top navbar fixed to the top of page when scrolling. $F_NIGHTMODE = Enables the night mode switch. $F_LEFT_SIDEBAR_LAYOUT = Enables the left side layout for stats. 1. 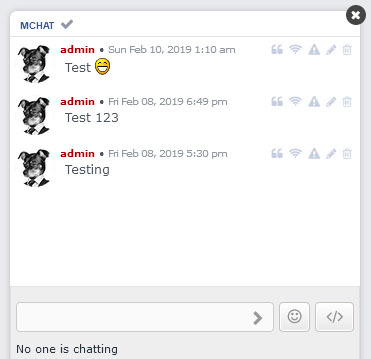 Download and install the MChat mod. Last edited by jrolson on Sat Mar 09, 2019 6:35 am, edited 17 times in total. is there a problem with the screenshot? when i click the images pages don't open. 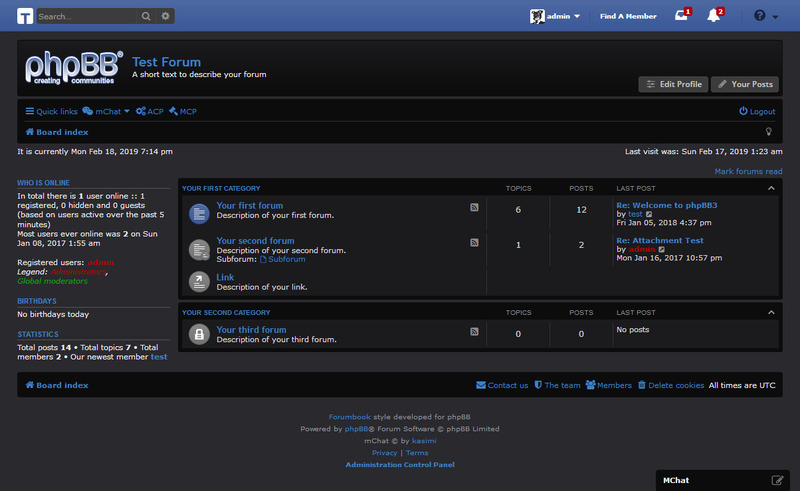 hello!...new to phpBB, and really like this side bar setup. my question is, how do i install it? i unzipped the file int my styles directory but its not showing up in the install styles section...what am i doing wrong? $F_LEFT_SIDEBAR_LAYOUT = Enables the left sidebar layout for stats. $F_RIGHT_SIDEBAR = Enables the right sidebar. 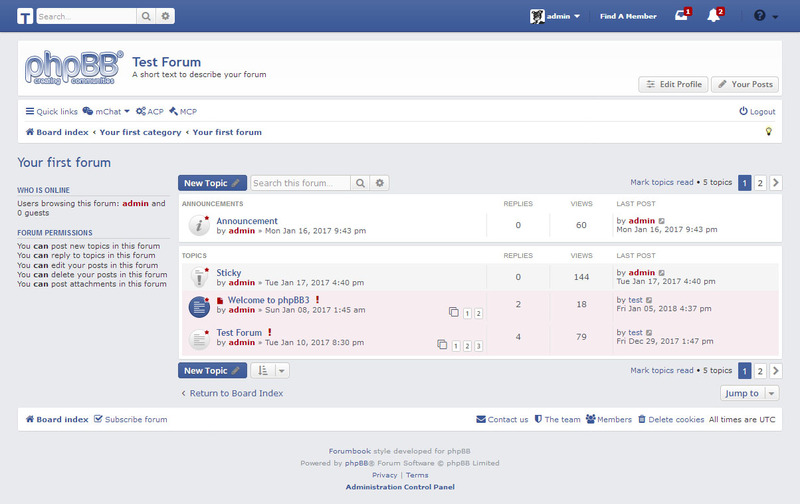 $F_SIDEBAR_DISPLAY_ALL = Show all notifications in the right sidebar. Anyway of retraining it ? this would be the icing on the cake for me. You could just disable the left sidebar unless you still want it. Link to the recent topics mod? is there a way to make this a dark theme? like when its night time some sites allow you to switch to a dark version of it? why is that option not in the config? Did you change anything in your overall_header.html where this comes into effect? I have the code with the logo in the config inserted. 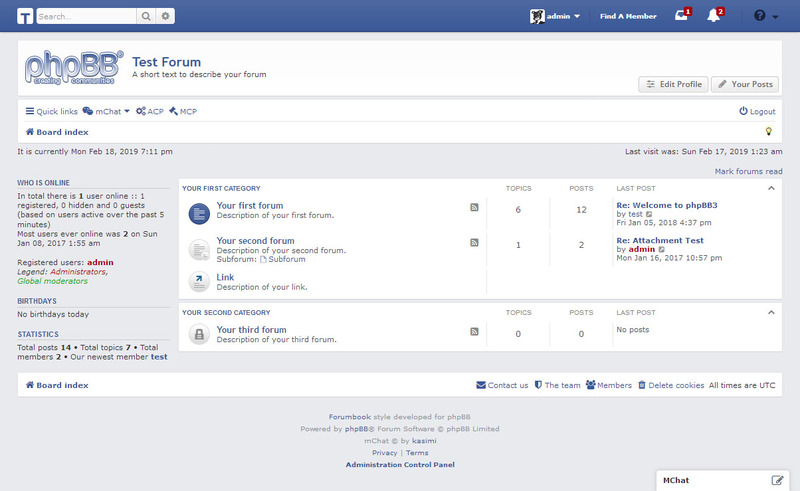 But first I want to remove the phpbb logo and then insert a new logo. Or can I simply upload a logo and this will be replaced by the phpbb logo?